I have a friend named Kanaga Raj. He sells me a newspaper every day. This is how he makes money to support himself. Every time I see him he has a smile for me and knows that I want the Deccan Chronicle. That is what we share in life; the rest is blocked by not knowing the same language. I want to know his story, does he have a wife? a family? another job? a pension? He has a nice dress shirt and lungie for when he sells papers from his tarp by the Chinimilay bus stop. 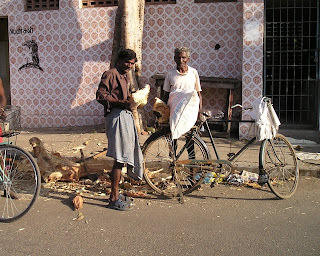 He has a friend nearby that sells fruit from a cart who will cover for him if he has to step out for a bit. But unless I bring someone who knows both our languages and sit and talk with him I can only know what I see. I see he also has a t-shirt with little holes around the neck and a pair of shorts. These he wears when he is transporting the papers or doing physical work. The government is digging up a lot of roads here improving the underground electrical and water management. Near the bus stand they found and removed several large roots. Kanaga Raj got one of these and when saw him at 9:00 am he was working on the root and when I came home from work at 4:00 he was still working at splitting off the wood. He made gestures to tell me that it is for a fire so he can cook his meals. It amazes me. If I had to guess an age I would say 70 or 80. A micro loan would help him to get more papers to sell on a daily basis, maybe an umbrella or a cart. Weekly business education would enrich his knowledge and help grow the number of customers he serves daily, to give him more money to support himself. That’s what Growing Opportunity does here, educate, help grow businesses, and help to encourage those who are discouraged. I do a small thing, working in the head office improving some paperwork and forms, but my coworkers in the field they give moral integrity by having faith in their neighbors, they speak the language and understand their situation. God is relational, we need to be too.